I’m loving all the light, natural and neutral tablescapes I’m seeing on Pinterest and Instagram lately. When I set the table for Easter dinner last weekend, I tried to keep those themes in mind. A year ago I went all pastels and very “Easter-y,” but this year I really just wanted something that was fresh and springy but still versatile enough to be used for any occasion this time of year. Here’s what I came up with, using things I had on hand! 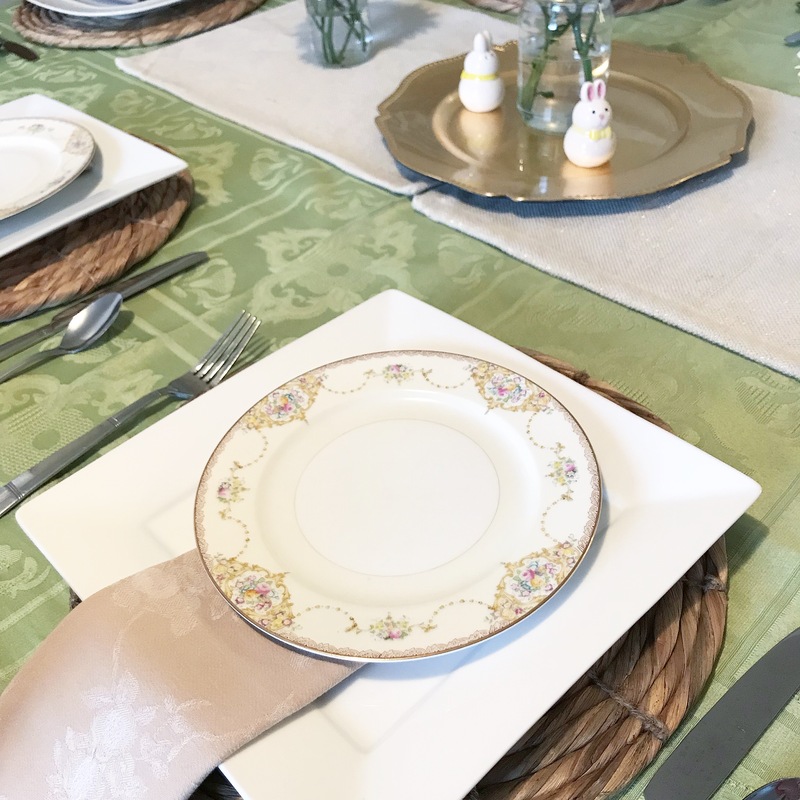 I knew my Gramma’s china would be perfect for Easter, but I’m still a little nervous to let those dishes loose on company (especially when there are kids involved). Instead of using the china dinner plates, I simply layered one of the salad plates over my white every day dinner plates. I instructed my guests to just move the salad plate over and use it for bread, and that worked really well! Layering the dishes over a woven charger kept the place setting from looking too fancy and gave me that natural look I was going for. Those are my $3 chargers from Dollar General, and they are back in stock in my stores right now! Instead of a runner, I laid down two linen/burlap place mats I recently dug out of the Target end caps (marked down to $1 each!). Although the cloth napkins are all a neutral tan, there are actually 3 different sets of napkins on the table. I have a few of this and a few of that, and it works pretty well! I also mixed two different sets of white plates. I love the uniform but not perfect look the varied dishes give to the table. For glassware, I served the adults in my clear iced tea glasses (currently on major sale!). My hobnail mason jar glasses from the Target dollar spot were a huge hit with the kids! Do you have china? I didn’t register for any but I’m so thrilled to have my Gramma’s wedding china and her Christmas china! I’m afraid of breaking my china too! But I don’t want to let that fear keep me from enjoying it, so I bring it out! I love family china! I have my great grandmother’s that she brought from Germany. So pretty! Your table looks beautiful! Wow! That’s a special set of dishes to have. Love that! I love the combination of new, vintage and variety of textures on your table. I need to check out those chargers because I bet my mom would love them. Maybe for Mother’s Day?? What a pretty table! I love the Spring feel and the florals. Mason jars make the best vases. Yes! They would be a great gift – and I’ve seen a few other matching pieces like a silverware caddy that would be great for entertaining! I love your table setting! I even looked up the tea glasses and boy is it ever a great sale! I was even offered a $10 off of $20 discount for signing up for their email newsletter and it could be used for regular AND sale prices. You don’t see that very often! I love china that’s been handed down through generations. I have my Moma and Daddy’s wedding china that my gandparents gifted to them. It’s a beautiful blue/silver design. I use it in the spring and summer for entertaining, not for every day use. (I have cream/gold china that I use in the fall and winter that I have picked up at various thrift stores.) I am saving my parents’ wedding china to gift to whichever of my daughters gets married first. (I have four!) My oldest daughter is currently engaged but not expected to marry until September 2019. One of my other daughters may marry before her. Who knows?! 😀 It’s all good though! ❤ Have a beautiful day! 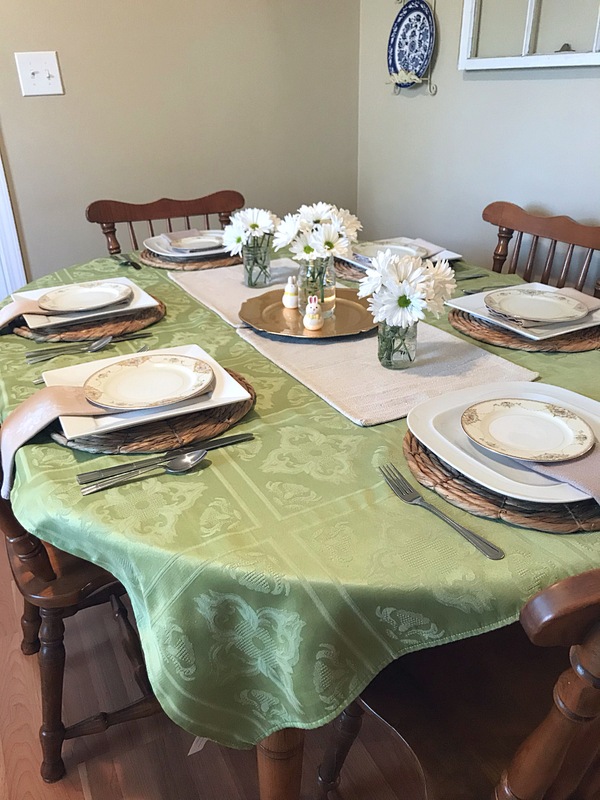 It looks like your table is oval like mine, and I can no longer find tablecloths to fit. What size tablecloth are you using? Karen, my table is an oval when I have both leaves in the middle (which isn’t very often). 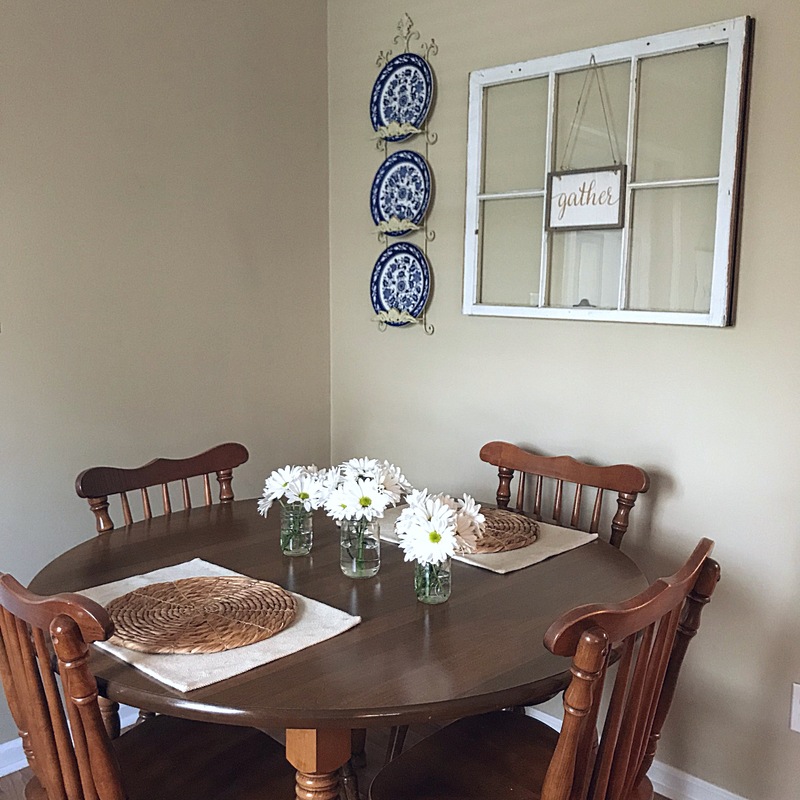 That table came from my grandparent’s house – as did that tablecloth! It’s really old but is a large rectangle. I don’t know what the dimensions are, sorry! Like you I didn’t get chino of my own, but I have my mother’s which is even more special. It doesn’t get used often, but sometimes I like to bring it out just because! You did a good job creating the look you wanted. I agree – our loved one’s china is always extra special!